I love designing and delivering presentations, but I don’t enjoy lugging my MacBook to meetings or perching it precariously on shaky lecterns. So I was thrilled to hear that Keynote was coming to the iPad, hoping that I could use it instead of my laptop when I travel. Unfortunately, Keynote for iPad is too limited to let me ditch my MacBook just yet. Keynote’s interface is similar to the Navigator View found in the desktop version of the software, Keynote ‘09 ( ). The interface has a column of slide thumbnails on the left and a generous slide display area on the right. But the panes aren’t adjustable, so you can’t magnify the thumbnails–unless the thumbnails contain easily recognizable graphics or very large text, it’s very difficult to tell them apart. And since the navigator displays no more than nine slides at a time, the interface is only acceptable for shuffling a few slides around. Unlike a real slide sorter, you don’t get a broad overview of your presentation. Two-Pane View: You can zoom in or out on the slide by pinching, but the navigator doesn’t expand to use the extra space when you zoom out. Keynote makes excellent use of the iPad’s multi-touch interface for manipulating objects, but some miscues are annoying. To set transitions, for example, you select a slide in the Navigator and then tap the same toolbar icon that you use to animate objects. But you can only apply transitions to one slide at a time, not much help when you want to change all the transitions in a 100-slide presentation. Keynote for iPad supports only a subset of Keynote ‘09’s effects and other controls. And some features that are found on both the desktop and iPad versions are partially supported on the iPad. For example, when you’re creating a slide with bulleted text, you can use only one type of image bullet, and the gamut of colors, outlines, shadows, and other effects is considerably more limited in the iPad app. Other desktop features, such as Smart Builds, recorded or embedded audio, hyperlinked objects, moves and other action builds, grouped objects, looped movies, and some builds and slide transitions, are missing completely from the iPad version. And if you rely on Presenter Notes to guide you when you’re using presenting, you’re out of luck, since they’re absent, too. 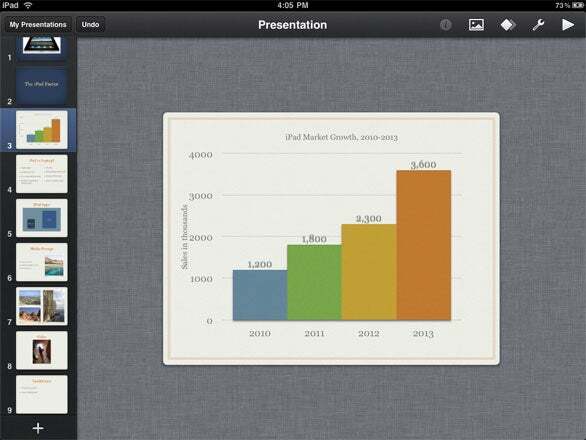 Many people will probably prefer to develop presentations on the Mac and then move them over to the iPad for touch-ups. (The iPad app only imports Keynote 2009 and PowerPoint files.) But editing a slideshow with the iPad’s absent and under-supported features makes the workflow trickier than it ought to be. When you open a transferred document on the iPad, Keynote presents a list of issues for you to review. Unfortunately, at this point it’s often too late to easily change your presentation to accommodate the iPad’s limitations. Unless you keep a detailed list of incompatible features handy when you’re working on your Mac, it’s likely that you’ll throw in a few effects that won’t work on the iPad, forcing you to scrounge for workarounds later. Apple has lessened the pain a bit by posting Keynote for iPad: Best practices for creating a presentation on a Mac for use on an iPad and Keynote for iPad: Frequently Asked Questions (FAQ), articles that list features that are missing from the iPad and recommend the themes, fonts, settings and other features you should use in Mac Keynote for presentations that will be used on an iPad. However, an update to Mac Keynote that warns you about problems before you export the document would be a welcome addition. The situation is especially challenging for people like me who have a substantial library of Keynote presentations developed over the years. Of the five presentations that I copied to my iPad and imported into Keynote, not one survived unscathed. In some cases, I was able to find substitutes for effects. For example, Magic Move, which lets you change an object’s position during a slide transition, can replace some Move actions, which shift objects around on a slide. Still, some of my lectures would have needed hours of work to make them iPad-ready, and most included essential animations and other special effects that I couldn’t duplicate on the iPad no matter how hard I tried. Another trap lurks even if you just want to use the iPad to add or change a few text slides. 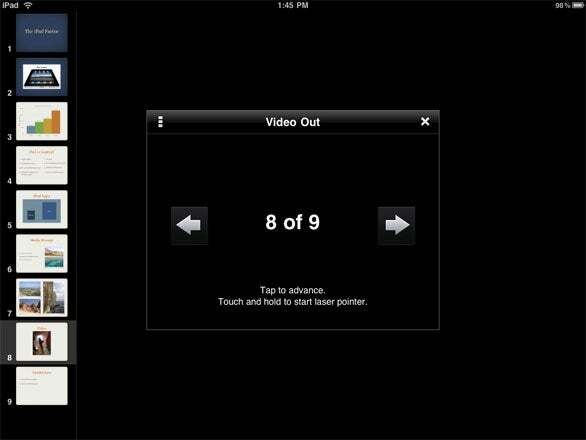 If there’s no iPad equivalent for an effect (a wipe build animation, say), Keynote substitutes another one in its place. When you transfer the document back to your Mac, the substitutions remain. That makes the iPad unsuitable for editing presentations that contain unsupported effects. The iPad imposes other restrictions that will frustrate anyone who relies on desktop applications like Adobe Photoshop and QuickTime Player to prepare pictures and movies for presentations. To use them on the iPad, you have to move them into the iPad’s Photos app or e-mail them to an account that you can access on the iPad. But neither method is particularly convenient, especially if you have more than a handful of documents to transfer. Delivering presentations using the iPad’s optional VGA adapter and an external projector was a bit frustrating, too. I expected to see my slides on the iPad’s screen, as I do when I use my MacBook. But Keynote displays only a column of small slide thumbnails along with a counter and arrows to advance or reverse the slides. Touching and holding brings up a handy laser pointer, but you have to look at the projection screen to aim it. Slideshow Guesswork: Small thumbnails make it difficult to choose slides when you’re using Keynote with a projector. Whether you consider Keynote brilliant or wanting depends on your expectations for the iPad, a device that clearly wasn’t intended as a laptop replacement. In some respects, Keynote for iPad reminds me of early versions of Mac Keynote, which were also imperfect. Even with its missing features, you can use Keynote to create visually-stunning presentations on your iPad, complete with drop-shadowed text, movies, animations, tables, charts, and graphics. At only $10, Keynote for iPad is a good value as a standalone tool. But as a complement to the desktop version, Keynote for iPad is disappointing, especially if you want to use it to tweak or deliver existing slideshows. Click here to comment on this review.